EOS offers several trips a year to travel to Nicaragua and see the impact being made to help families lift themselves out of poverty. Additionally you will have the opportunity to install life-changing technologies and gain a deeper understanding of Nicaragua. 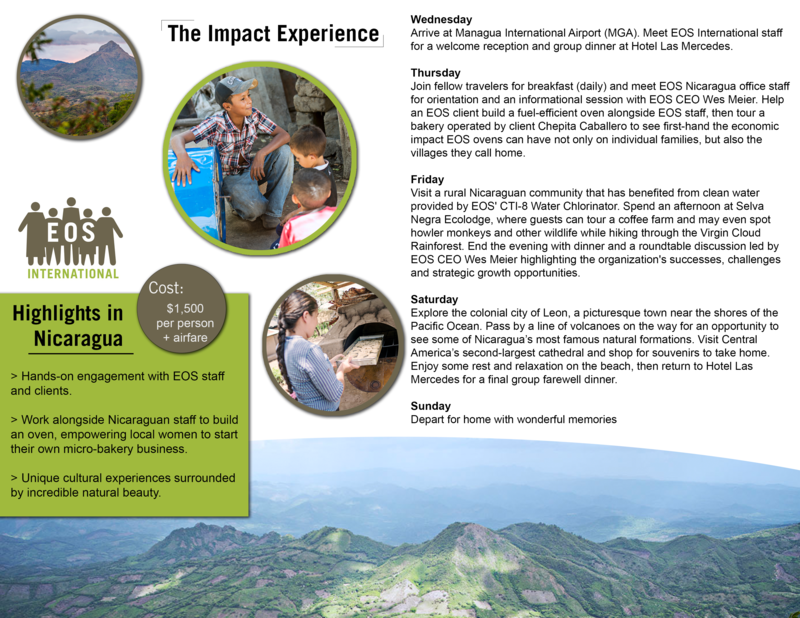 Want to travel with EOS and see the impact that you are making happen? These are not mission trips – they’re adventure impact trips. We play hard, work hard and love getting to know the people who are a part of EOS International. On this trip, you’ll have the opportunity to learn about Nicaraguan history and culture, and to gain a deeper understanding of the value of safe drinking water, access to lights, or even the opportunities of starting a business. You’ll journey through the lush countryside to meet rural villagers that have committed to maintaining safe water for the betterment of their community and country. You’ll see first-hand how we can overcome our world’s most critical food and water challenges when we work together. Trip Cost: Trip cost is $1,500 in total including accommodations, projects, meals, ground transportation, and other activities. Air fare is not included. -How long is the trip? Five days including travel to/from the United States. -Who leads the trips? EOS International US and Nicaraguan team. -Do I need vaccinations? Ask your doctor for the most up to date medical information. -Where will we go? Each trip varies but usually trips will include visits to Managua, EOS Central American headquarters in San Isidro, and day trips to Leon or Granada. – What will we be doing? Impact Experience trips include personal visits to customer beneficiaries to see the technologies in action and provide an opportunity to learn about how it has impacted their life. You will also have time for some fun trips exploring the beautiful countryside of Nicaragua.